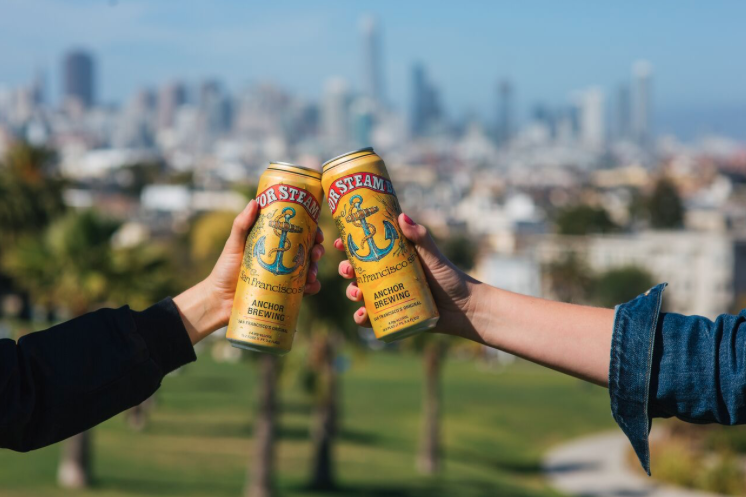 SAN FRANCISCO–Anchor Brewing Company announces a new spin on Anchor Steam® Beer, San Francisco’s original since 1896. Arriving just in time for summer adventures, Anchor’s flagship beer is now available in cans for the first time and this 19.2oz offering gives beer fans even more opportunities to enjoy Anchor Steam wherever they go. In 1965, Fritz Maytag acquired and revived the struggling Anchor Brewery. Anchor Steam (4.9% ABV) was the first handcrafted beer to be revitalized in America after Prohibition starting a revolution in beer that originated today’s craft beer movement. In 1971, Fritz Maytag began bottling Anchor Steam Beer—the first bottled Anchor Steam in modern times. The distinctly flavored San Francisco original has been classically handcrafted in Anchor’s copper brewhouse for 122 years and counting. Neither fully a lager nor fully an ale, Anchor Steam is in a category of its own, created by fermenting a lager yeast at warmer ale temperatures. Anchor Steam owes its bright copper color, frosty tan head, and rich, distinctive flavor to this unique, historic brewing process. It is a process that combines deep respect for brewing tradition with many decades of evolution to arrive at a unique approach: a blend of pale and caramel malts, fermentation with lager yeast at warmer ale temperatures in shallow open-air fermenters, and gentle carbonation in Anchor’s cellars through an all-natural process called kräusening. Anchor Steam cans are available in a convenient single size or easy to grab 4-pack nationwide. Find a beer near you using the Anchor Beer Finder. For more information on the history and craft of Anchor Steam Beer, please watch the following video: Anchor Steam Beer Video. Learn more about Anchor Brewing at www.anchorbrewing.com and follow @anchorbrewing on social media. Please bring Anchor California Lager back into Texas. At lease DFW! !